I am always worrying about dropping my phone and cracking the screen. It’s so easily done isn’t it! I’ve had a hard shell case on my phone for just over a year now, but it was starting to look a little worse for wear where the corners have become cracked due to me dropping it on the floor. 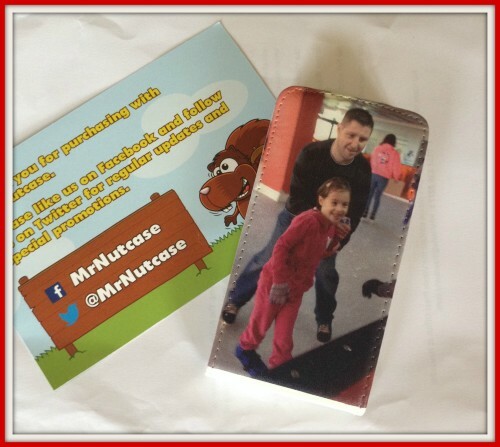 When I was offered the chance to review a phone case from Mr Nutcase, I was eager to try out a different type of case. There are three types of case available from Mr Nutcase, the slimline hard shell, the leather flip or the wrap around image. I immediately decided to opt for the leather flip as I haven’t had a case like this before. There are different options to be able to choose a pre set design or of course upload your own. I knew just the image I wanted to set about uploading my image to the site. As I chose the leather flip, I was advised that my image would only be printed on one side and the remainder of the case would be a plain cream colour. I actually think this looks nice, so I was happy to proceed with this. My case arrived really quickly from the point of ordering, and I was set to go. The leather outer is attached to a shell area for the phone to sit in. It’s so secure in there, I have trouble removing my phone from the case. I was worried that the shell would come away from the case, but it’s withstanding some rough treatment and it’s staying nice and secure so thumbs up from me for the quality. The image has printed very nicely only to the case with very minimal bleeding against the shine of the leather. I have been impressed with the final item. Now when my phone is in my bag, it’s protected both front and back without me having to worry about scratches etc. There is even plenty of room to plug the charger in without the case getting in the way. Top marks from me and worth the £19.99 price tag. That’s a great picture you’ve chosen and I love the overall look of the case – great for protecting your phone. Love the photo you have chosen, it works well with the shape of the case I think. Really lovely photo. I am really pleased with mine too. I love these cases, the pictures look so crisp and bright, love your choice of photo too! love the quality. look great. Love that photo, mine still looks as good as new and everyone comments on it – great cases.